Supposedly the Fed's mandate of an inflation target and employment levels means it does not give too much weight to economic activity outside the U.S. in spite of the global nature of the economy. 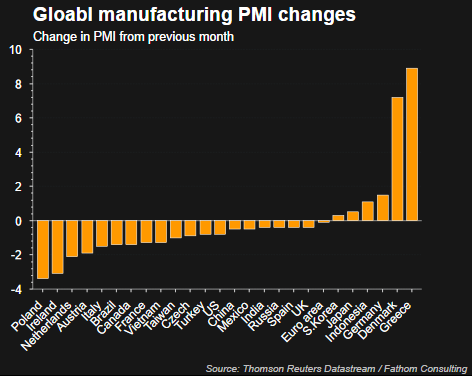 However, given the interconnected nature of economies around the world, the below chart of purchasing managers indices suggests many are seeing potential weakness ahead. The U.S. PMI that was released earlier this month was reported at 53, down from 53.8, which is the lowest level since October, 2013. "The shocking weakness in August was no fluke as the Empire State index came in far below expectations for September, at minus 14.67. Next only to August's minus 14.92, September's reading is the weakest of the recovery, since April 2009. And, unfortunately, judging by new orders, activity in October may prove to be just as weak. New orders are deeply negative this month, at minus 12.91 vs minus 15.70 in August and the fourth straight negative reading. And manufacturers in the New York region won't be able to turn to backlogs which are extending their long run of contraction at minus 8.25. "Searching for positives in this report is difficult. Negative signs sweep components including shipments, at minus 7.98 following August's minus 13.79. If extended to national data, these results point to trouble for third-quarter GDP. Employment is at minus 6.19 which is the first negative reading since all the way back in January 2013. The workweek, reflecting the weakness in shipments, is down very steeply at minus 10.31. Price data show outright contraction for finished goods at minus 5.15 -- the first negative reading since November 2013. And rounding things out is a 10 point loss in the 6-month outlook to 23.21 which is the weakest since, once again, January 2013." The weakness in the Empire survey also carried over into the industrial production report released shortly after the Empire survey. 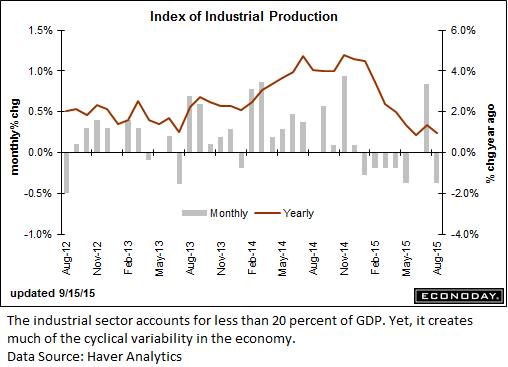 Econoday had this to say about the industrial production report. "A reversal in the auto sector pulled down industrial production in August, falling 0.4 percent vs the Econoday consensus for a 0.2 percent decline. The manufacturing component fell 0.5 percent, also deeper than the consensus at minus 0.3 percent. In an offset, gains in July proved more robust than initially reported with total industrial production revised 3 tenths higher to plus 0.9 percent and manufacturing revised 1 tenth higher, now also at plus 0.9 percent. "Motor vehicle production is August's disappointment, down 6.4 percent following July's giant 10.6 percent spike. When excluding motor vehicle production, however, industrial production was unchanged in August following respectable gains of 0.3 percent in the prior two months. But these readings are far from spectacular and the weakness in the latest month could be a signal of retrenchment tied to Chinese-based volatility." 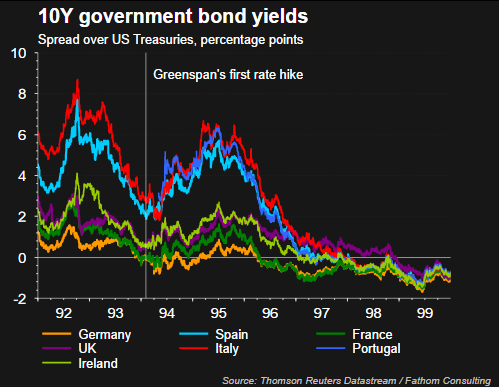 Recent weakness in emerging market equities have investors thinking back to the emerging market disruption in 1994 when Greenspan embarked on a tightening cycle. A rate increase in the U.S. resulted in an increase in rates in emerging market countries. Not unlike today, emerging market countries borrowed in U.S. Dollars. Repaying the debt became more expensive as the Dollar strengthened. Today, the U.S. Dollar has been stronger for several years in spite of U.S. rates remaining low. A part of the Dollar strength is attributable to the European Central Bank's QE program and Japan's large QE program. These QE operations taking place outside the U.S. have lowered other counties' interest rates with the result being a stronger Dollar. A move higher in U.S. rates will likely translate into further US Dollar strength. The below chart could lead one to make the case that a large part of the strengthening move in the USD has already occurred. The QE activities outside the U.S though are influencing currencies and the uncharted territory aspect of QEs makes it difficult to determine the extent of QE's influence on the Dollar. "For a second report in a row, upward revisions highlight solid growth in retail sales. 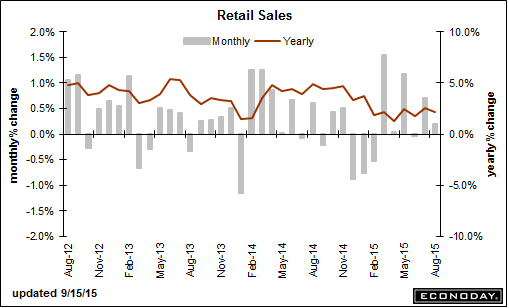 Retail sales rose 0.2 percent in August with ex-auto at plus 0.1 percent and ex-auto ex-gas at plus 0.3 percent. These are all 1 tenth below consensus. July, however, shows broad upward revisions with total sales at a very strong plus 0.7 percent vs an initial plus 0.6 percent. Ex-auto for July is revised upward by 2 tenths to plus 0.6 percent and ex-auto ex-gas revised upward by 3 tenths to plus 0.7 percent." In summary, the Fed's mandate is focused on inflation and the the YOY change in CPI came in at a low .1% last month. The CPI report for July will be released Wednesday, but it does seem to be a stretch to think the Fed's inflation target is even close to being reached. 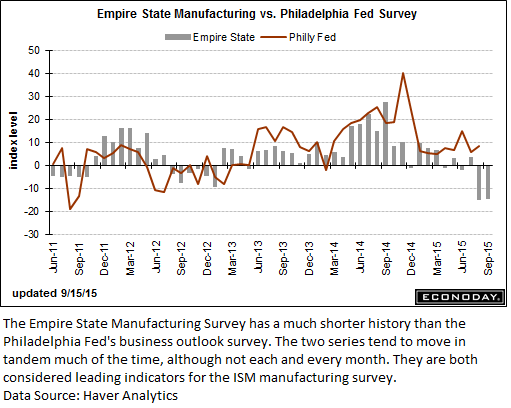 The above sample of economic reports/charts indicates the U.S. economy is growing at a bump along pace at best. The risk is the fact the emerging market economies seem to be more challenged than in U.S. Higher rates are likely to place some pressure on the emerging market countries that are carrying higher levels of debt. Large multinational U.S. companies will likely be further impacted by a stronger Dollar as foreign sales will be more expensive. 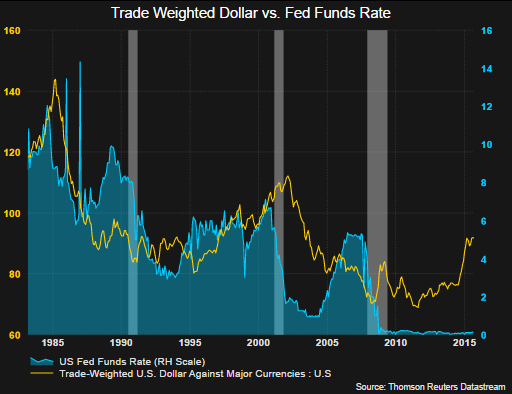 The second to last chart shows the Dollar has had a significant move already, so it is possible US Dollar strength will be at a more moderate pace going forward even if the Fed raises rates, especially if the rate increases are not pursued as consistently as history would suggest. But yes, the rate increases are to be data dependent so a promise by the Fed not to increase rates, even within some time frame, is not a likely position the Fed wants to put itself into.